Adult pulmonary Langerhans’ cell histiocytosis is a rare disorder of unknown aetiology that occurs predominantly in young smokers, with an incidence peak at 20–40 yrs of age. In adults, pulmonary involvement with Langerhans’ cell histiocytosis usually occurs as a single-system disease and is characterised by focal Langerhans’ cell granulomas infiltrating and destroying distal bronchioles. High-resolution computed tomography (HRCT) of the chest is essential to the diagnosis, typically showing a combination of nodules, cavitated nodules, and thick- and thin-walled cysts. A high macrophage count in bronchoalveolar lavage (BAL) fluid is a common but nonspecific finding that merely reflects exposure to tobacco smoke. BAL is useful for eliminating infections and the other infiltrating lung disorders that can be seen in young adults. Langerhans’ cells can be identified in BAL fluid, but, in contrast to what was initially hoped, this test shows a very low sensitivity and is rarely useful in the diagnosis of the disease. No effective treatment is available to date, and improved understanding of the mechanisms involved in the pathogenesis of pulmonary Langerhans’ cell histiocytosis is urgently needed, and should help in the development of specific therapeutic strategies for patients with this orphan disease. Langerhans’ cell (LC) histiocytosis (LCH) encompasses a group of disorders of unknown origin with widely diverse clinical presentations and outcomes, characterised by infiltration of the involved tissues by large numbers of LCs, often organised into granulomas. The classification of LCH clinical patterns developed by the Histiocyte Society is based chiefly on the number of organs involved 1, 2. Acute disseminated LCH (Letterer–Siwe disease) is a severe multisystemic disease that predominantly affects young children and less commonly older adults and carries a poor prognosis 3–6. Multifocal LCH is seen mainly in older children and adolescents (Hand–Schüller–Christian syndrome or multifocal eosinophilic granuloma) and runs a variable but usually more favourable course 3–6. Single-system disease (eosinophilic granuloma and primary pulmonary histiocytosis) is characterised by the involvement of a single organ (bone, lungs or skin) and usually follows a benign course and can regress spontaneously 3–6. Pulmonary involvement in patients with multisystemic disease is rarely at the forefront of the clinical picture, yet may be of adverse prognostic significance 5. Isolated or predominant pulmonary involvement is the pattern encountered by pulmonologists in adults and has a number of specific epidemiological and clinical features that warrant its individualisation as a separate entity 7–9. Pulmonary LCH (PLCH) in adults is an uncommon disorder that occurs almost exclusively in smokers and for which accurate epidemiological data are not available. In an early series of >500 patients with diffuse infiltrating lung disease, surgical lung biopsy showed LCH in <5% of cases 10. Over a 6-yr period, Colby and Lombard 11 identified 15 cases of PLCH compared with 274 cases of sarcoidosis among patients evaluated at a referral centre. More recently, in a 5-yr prospective study in 20 pulmonology centres in Belgium, 360 patients with interstitial pneumonia were identified, of whom 3% had LCH 12. A study of discharge diagnoses in hospitals with >200 beds found 160 cases of PLCH over a 1-yr period in Japan, with the crude prevalence of the disease estimated at 0.27 and 0.07 per 100,000 population in males and females, respectively 13. Although this survey carries some bias and was not comprehensive, these data at least confirm that severe PLCH is rare. The prevalence of PLCH is, however, probably underestimated because some patients exhibit no symptoms or experience spontaneous remission, and histological findings are nonspecific in the advanced forms. The wide use of chest high-resolution computed tomography (HRCT) in the evaluation of patients may lead to an increase in the number of patients in whom PLCH is diagnosed. A few familial cases of LCH have been reported 14, but pulmonary disease occurs sporadically. Although PLCH has rarely been described in Black patients 15, 16, no accurate epidemiological data are available regarding racial differences. The clinical and epidemiological features of PLCH in Asians have recently been described 13. PLCH predominantly affects young adults, with a frequency peak at 20–40 yrs of age 6, 11, 13, 15–21. Female patients may be slightly older, particularly in the USA 15. A marked male predominance was initially reported 17, but, in more recent studies, a similar proportion of males and females, or even a slight predominance of females, was observed, particularly in series from the USA 6, 11, 15, 16, 19, 21. These differences probably reflect smoking habit changes over time. Indeed, the most striking epidemiological characteristic of adult PLCH is that 90–100% of patients are smokers (often smoking >20 cigarettes·day-1) 6, 11, 13, 15–22. No other epidemiological factors associated with PLCH have been identified. Cases of PLCH have been reported after radiation therapy and/or chemotherapy for lymphoma, most notably Hodgkin’s disease 23–25. PLCH is pleomorphic in its presentation 6–9, 11, 13, 15–21. Despite diffuse lung involvement, symptoms can be relatively minor or absent, and patients often initially attribute their symptoms to smoking. The interval between the onset of clinical symptoms and diagnosis is highly variable, but, on average, is ∼6 months 15. The diagnosis is usually made in one of the following three circumstances. 1) In ∼25% of cases, the disease causes no symptoms and is detected on a routine chest radiograph. 2) Respiratory symptoms, mainly a dry cough and, somewhat less frequently, dyspnoea on exertion, are present in approximately two-thirds of cases and can be associated with constitutional manifestations (asthenia, fever, night sweats and weight loss). 3) Spontaneous pneumothorax responsible for chest pain leads to the diagnosis in ∼10–20% of cases. The occurrence of pneumothorax seems more common in young males, may occur at any time during the course of the disease and may be bilateral and/or recurrent, raising difficult therapeutic challenges 6, 11, 13, 15–21, 26, 27. Pneumothorax should also be excluded in any patient complaining of increased dyspnoea. Other infrequent presentations include chest pain resulting from an associated rib lesion or wheezing. Haemoptysis is uncommon and should not be attributed to PLCH until other causes (particularly lung cancer in these smoking patients) have been ruled out 8, 15, 16, 19, 28. PLCH in adults is usually a single-system disease. In the large majority of patients, there is no evidence for the involvement of other tissues. Bone lesions (<20% of patients), diabetes insipidus with polyuria and polydipsia, resulting from infiltration of the posterior pituitary (5% of patients), and skin lesions are the most common extrapulmonary manifestations 6, 13, 15–21. The result of physical examination of the chest is usually normal, except in patients with pneumothorax, rib lesions or advanced disease with signs of cor pulmonale. Rales are rarely present and clubbing is exceedingly rare. In patients without extrapulmonary involvement, the remainder of the physical examination results are typically unremarkable. A standard chest radiograph performed as a routine investigation leads to the diagnosis of adult PLCH in a substantial proportion of cases 7–9. The abnormalities vary with the stage of the disease. Reticulomicronodular infiltration is the commonest pattern 7–9, 29. Cysts may be visible within the infiltrates, which symmetrically involve both lungs, predominating in the middle and upper lung fields and sparing the costophrenic angles 29. The infiltrates are often extensive, contrasting with the mildness of the respiratory symptoms. In contrast with most other diffuse pulmonary infiltrating diseases, except lymphangioleiomyomatosis, lung volumes are normal or increased. Pneumothorax or, more rarely, a lytic lesion in a rib may be visible, providing valuable diagnostic orientation. Fluid pleural effusion is not a feature, and mediastinal adenopathy is unusual, although hilar enlargement may occur in patients with pulmonary hypertension 7–9, 29, 30. In advanced disease, nodular lesions are sparse or absent, and cysts constitute the main radiographic abnormality, sometimes producing an emphysema-like appearance. Finally, in rare cases, the chest radiograph may be normal (<10% of patients in an early series) 31. HRCT has proved a major breakthrough in the diagnosis of PLCH, and is now mandatory when this condition is suspected 7–9. HRCT provides additional details about the parenchymal elementary lesions, such as cavitation of nodules, which is not readily visible on standard radiographs 30, 32. Similarly, the reticulation seen on standard radiographs is usually produced by contiguous small pulmonary cysts. HRCT also permits the demonstration of parenchymal abnormalities in the rare patients whose chest radiographs are interpreted as normal. The typical HRCT pattern combines small poorly limited nodules, cavitated nodules, and thick- and thin-walled cysts (fig. 1⇓). These changes affect both the peripheral and the central parts of the lung fields. The lesions are focal, being separated by parenchyma that appears normal, usually predominate in the upper and middle lung fields, and tend to spare the basal portions of the lungs. The distribution of the nodules is centrilobular, reflecting the bronchiole-centred development of PLCH lesions. As the disease evolves, cystic lesions become a predominant finding (fig. 2⇓). They vary in size, although most are <1 cm in diameter, and may be isolated or confluent, sometimes mimicking centrilobular emphysema. Longitudinal studies involving serial CT scans have shown that radiological lesions progress over time from nodules to cavitated nodules, then thick-walled cysts and finally thin-walled cysts 33. They have also shown that nodules and cavitated nodules can resolve, whereas cysts usually persist or enlarge over time 33. Other findings in PLCH may include ground-glass attenuation and linear densities or emphysematous bullae secondary to cigarette smoke exposure 30, 32. Pleural fluid effusion is exceedingly rare and mediastinal adenopathy unusual. Pulmonary artery enlargement has been reported in some patients 30. Finally, HRCT is crucial for selecting surgical biopsy sites in those patients who require this investigation. High-resolution computed tomography scan of the chest in a patient with pulmonary Langerhans’ cell histiocytosis, showing the typical combination of nodules, cavitated nodules, and thick- and thin-walled cysts. High-resolution computed tomography scan of the chest in a patient with advanced pulmonary Langerhans’ cell histiocytosis, showing numerous variably sized pulmonary cysts that are confluent in some places. Pulmonary function abnormalities are variable and depend on both the predominant anatomical lesions and disease duration 7, 8. Extensive radiological changes are not uncommon, however, in patients with little or no pulmonary function impairment. Pulmonary function is normal at rest in 10–15% of patients 13, 16, 17, 19–21. A reduction in the diffusing capacity of the lung for carbon monoxide (DL,CO) is the most common functional abnormality, being found in 70–90% of patients 13, 16, 17, 19–21. In the majority of patients, an obstructive dysfunction can be observed. Low vital capacity (VC), mild alterations in total lung capacity (TLC) and an elevated residual volume (RV)/TLC ratio constitute a common function testing profile. In a sizeable proportion of patients, airflow limitation is present. Although most patients are smokers, which may contribute to the observed abnormalities, the degree of airway obstruction appears out of proportion to total cigarette consumption and probably reflects the predominantly bronchiolar location of PLCH lesions. Flow–volume curve alterations are seen in ∼50% of patients, and the ratio of forced expiratory volume in one second (FEV1) to VC is low in 20–30% of patients with recent-onset PLCH, and in a far greater proportion of patients with advanced disease 13, 16–21. An obstructive pattern in a patient with diffuse pulmonary infiltrates is suggestive of PLCH. In a minority of patients, pure restrictive dysfunction has been reported 16, 19–21. Blood gas levels at rest remain normal for a long time; earlier in the disease, exertion may cause alveolar–arterial oxygen gradient elevation and hypoxaemia 16, 18, and this exercise limitation in patients with PLCH has been ascribed to vascular impairment 16. The extent of the abnormalities detected by HRCT has been correlated with DL,CO 30. A detailed study comparing the progression of HRCT findings and pulmonary function in patients with PLCH is not currently available. The bronchial tree is normal on gross examination or shows only nonspecific inflammation related to smoking. Bronchial mucosa biopsy specimens are not helpful in the diagnosis of PLCH but are useful in ruling out other diagnoses, most notably in patients with atypical manifestations. Transbronchial biopsy procedures may show PLCH provided multiple specimens are obtained and examined extensively, using immunohistochemical techniques if necessary 19, 34, 35. Studies from the USA, where transbronchial biopsy is more widely used in this setting, found diagnostic yields ranging only 10–40%, reflecting the focal distribution of the parenchymatous lesions 19, 34, 35. In addition, the risk of pneumothorax is probably increased in patients with pulmonary cysts. The number of cells recovered by bronchoalveolar lavage (BAL) is usually increased, and cell counts of >1×106 cells·mL-1 are common, with a marked predominance of alveolar macrophages. This finding reflects cigarette smoke exposure, and the macrophage count is strongly correlated with the level of daily cigarette consumption 22. Alveolar cell counts are normal in the small minority of patients who are nonsmokers. Differential BAL fluid cell counts may show a moderate nonspecific increase in eosinophil numbers (usually <10%) 7, 22. The proportion of alveolar lymphocytes is normal or diminished, and the CD4/CD8 ratio is decreased, as is observed in smokers. The identification of LCs among cells recovered by lavage using monoclonal antibodies directed against CD1a (OKT6 or equivalent) has previously been suggested to be useful as a diagnostic test in PLCH 36–38, but more recent evidence indicates that this approach can be disappointing and lacks sensitivity. False positive results are common and the specimens must be examined by an experienced cytologist. LC densities of up to 3% can be recovered by lavage from cigarette smokers without diffuse lung disease, and increased numbers of LCs (up to 4% (unpublished data)) can be seen in patients with diffuse interstitial lung disease associated with alveolar hyperplasia (particularly diffuse pulmonary fibrosis) 7, 39. If the threshold of 5% LCs is used for the diagnosis of LCH in adults, the specificity of the test is good but the sensitivity appears to be quite low (<25% in the present author’s experience). In most adults with PLCH, the proportion of CD1a-positive LCs is similar to that found in smokers without lung disease. It remains to be established whether the clinical characteristics of patients with and without increased numbers of LCs on lavage are different. In practice, BAL rarely establishes a definite diagnosis of PLCH in adults, but rather provides additional orientation by showing high alveolar macrophage counts. It is of greatest use in differential diagnosis in patients without typical radiological findings. The test can be used to orient the diagnosis away from interstitial lung diseases with more characteristic lavage findings, and rule out certain pulmonary infections, such as excavated forms of Pneumocystis carinii (recently renamed P. Jiroveci) pneumonia, which may cause confusion in certain cases 40. Standard laboratory tests are uninformative. A mild increase in peripheral neutrophil counts related to smoking may be found, but eosinophil counts are not elevated. Evidence of a systemic inflammatory reaction (e.g. increased sedimentation rate) may be present in occasional patients, but is typically absent. Serum immunoglobulin levels are normal. Various autoantibodies and circulating immune complexes have been found at low levels but are of no diagnostic significance. In patients with constitutional symptoms, serological tests should be performed in order to rule out HIV infection. Serum levels of angiotensin-converting enzyme are usually normal. Atypical forms of PLCH are very uncommon but raise major diagnostic challenges. A variety of atypical radiographic findings have been reported, including isolated nodules, markedly asymmetric radiological abnormalities, air fluid levels in cystic lesions, focal “alveolar” consolidation, pleural effusion and mediastinal adenopathy 41–45. 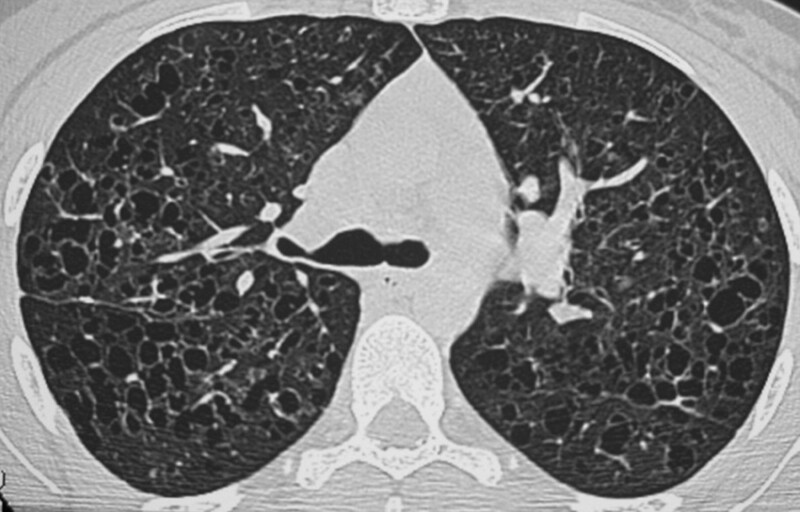 Recently, rare cases with extensive ground-glass opacities on lung HRCT have been reported 46. 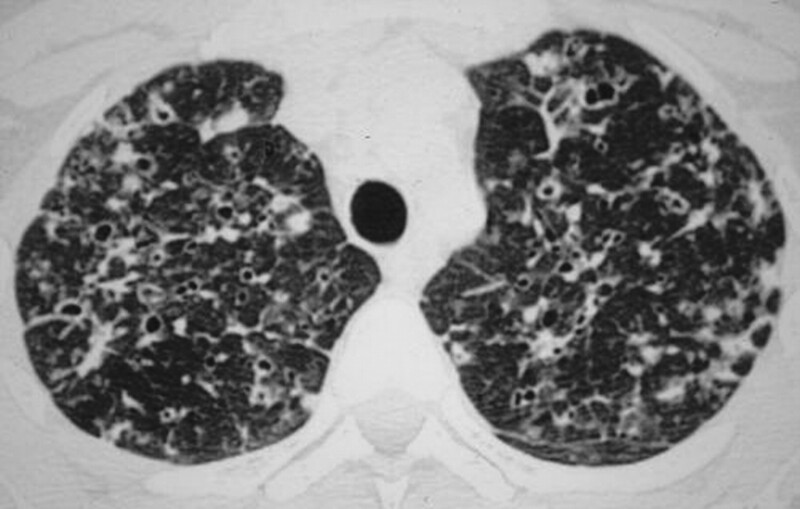 This ground-glass pattern seems to reflect the extent of the histological respiratory bronchiolitis-associated interstitial lung disease (RB-ILD)-like changes related to smoking that are observed in the lungs of these patients 46. PLCH can be associated with severe pulmonary arterial hypertension, and symptoms and haemodynamic features similar to those seen in primary pulmonary hypertension can dominate the clinical presentation 47. The pulmonary vascular lesions tend to predominate in the venules and may produce a picture reminiscent of pulmonary veno-occlusive disease 47, 48. Accumulation of activated LCs organised into loose granulomas that develop in, and destroy, the distal bronchiole walls is the pathological hallmark of PLCH. Lymphocytes and inflammatory cells, including eosinophils and macrophages, are also found. In most respects, the morphology of LCs in LCH is similar to that found in normal tissues 49. Viewed using light microscopy, LCs are moderately sized cells (15 μm in diameter). They have a convoluted irregular nucleus and a pale weakly eosinophilic cytoplasm that contains few, if any, phagocytic particles. Cell type confirmation must be obtained by immunohistochemical staining with monoclonal antibodies directed against the membrane antigen CD1a or by electron microscopic visualisation of Birbeck granules, which are more numerous than in normal LCs 50–52 (fig. 3⇓). The nature of LCs present in the lesions can also be confirmed with an antibody against langerin, a lectin specifically expressed by LCs, including those in LCH lesions 53, 54. Positive staining for the intracellular S100 protein, although widely used in the past to identify LCs, is not specific to these cells and can also be observed in other cell types, such as neuroendocrine cells and some macrophages. Electron micrograph of a Langerhans’ cell in a Langerhans’ cell histiocytosis lesion containing numerous Birbeck granules. Scale bar = 50 nm. The appearance of LCH lesions varies with the stage of the disease and the tissue involved. In the lung, the lesions are focal, poorly demarcated, separated by apparently normal lung parenchyma, and centred on the terminal and respiratory bronchioles, destroying the airway walls 7, 8, 11, 15, 17, 19. In view of this feature, PLCH resembles bronchiolitis rather than a diffuse infiltrating lung disease. The granulomas are poorly demarcated, however, and extend into adjacent alveolar structures. In addition, these alveoli often contain an abundance of pigmented macrophages, producing RB-ILD-like changes or a desquamative interstitial pneumonia-like pattern 11, 46. In uninvolved areas, the lung architecture seems normal, despite the common presence of nonspecific smoking-related abnormalities (respiratory bronchiolitis, intra-alveolar accumulation of pigmented macrophages and lymphoid clusters infiltrating the alveolar walls). The pathological features change over time, and lesions of various ages are often found in the same lung biopsy specimen. Early lesions are responsible for eccentric infiltration of the walls of terminal and respiratory bronchioles, which undergo gradual destruction (fig. 4⇓). Owing to their close anatomical association with bronchioles, spread to adjacent arterioles is common, although the disease is not primarily a vasculitis. LCs are abundant at this stage and form a compact central granuloma with a large number of lymphocytes located between the LCs and at the periphery of the lesion. Inflammatory cells, mainly eosinophils and macrophages, are also present in variable numbers. Destruction of the bronchiolar epithelium occurs early in the disease process, such that the bronchiole-centred development of the lesions may be difficult to confirm on a single section. Three-dimensional reconstruction of the lesions from serial sections shows a granulomatous cuff spreading along the walls of the distal airways 55. Although early lesions often seem cavitated, the cavity is the residual lumen of the bronchiole destroyed by the granulomatous reaction and does not result from tissue necrosis. Later in the process, the LCs are less abundant and form clusters surrounded by lymphocytes and inflammatory cells, including eosinophils, macrophages and a smaller number of neutrophils. Lymphoid nests are often seen peripherally at the interface with an incipient fibrous reaction. Finally, in advanced disease, there are few or no LCs, and macrophages containing pigment or lipid inclusions are found. The lesions are replaced by stellar fibrotic scars or by confluent and adjacent cystic cavities surrounded by a fibrous ring, which, when confluent, can give a honeycomb aspect. Traction emphysema contributes to the cystic appearance of advanced lesions. 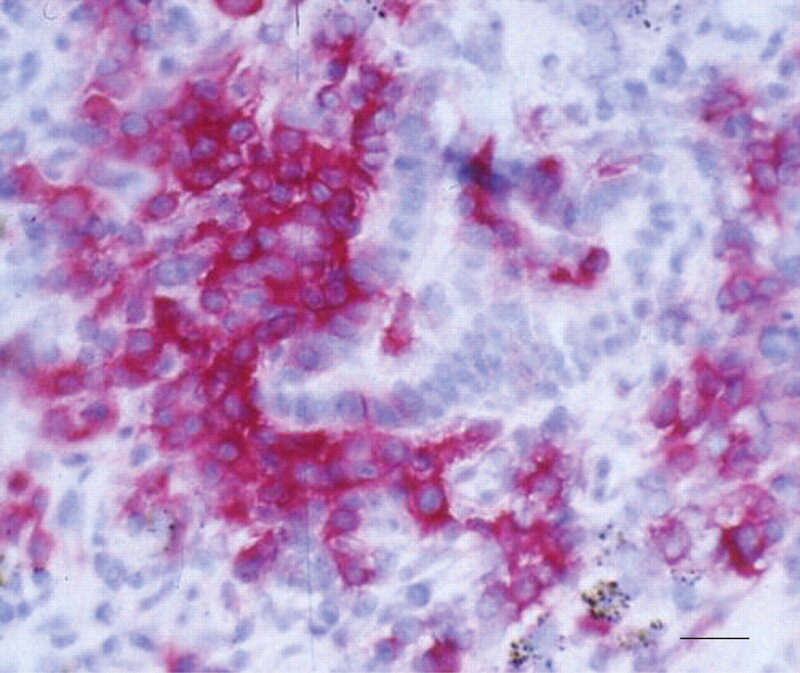 Immunostaining (haematoxylin and eosin) of an early lesion of pulmonary Langerhans’ cell histiocytosis with an antibody directed against CD1a. The bronchiole wall is infiltrated and partially destroyed by numerous Langerhans’ cells. Scale bar = 25 μm. The definite diagnosis of LCH rests on the identification of an LC granuloma in a tissue involved by the disease. Although transbronchial biopsy may show LC granulomas in patients with PLCH, histological documentation is more often obtained by surgical biopsy (usually video-assisted thoracoscopy). The biopsy specimens should be taken from sites at which HRCT shows an abundance of nodules. Since the lesions are focal, precautions should be taken to increase the diagnostic yield: the specimens should be sufficiently large to ensure the availability of adequate material; an extensive search for specific lesions should be performed; and, whenever possible, a tissue fragment should be frozen for immunohistochemical studies aimed at identifying LCs. When no frozen tissue is available, the specimens can be tested with the anti-CD1a O10 antibody, which reacts with LCs in LCH granulomas fixed in formalin and embedded in paraffin 56, 57. Features of desquamative interstitial pneumonia- or RB-ILD-like patterns may mask the LCH lesions, and the presence of these findings should not discourage a meticulous search for pathological changes specific to LCH 11, 19, 46, 58. In patients with suggestive clinical manifestations, HRCT findings are often sufficient to establish the diagnosis, such that the need for surgical biopsy should be discussed on a case-by-case basis by an experienced pulmonologist. A nodular and cystic pattern predominating in the upper half of the lung fields in a young asymptomatic smoker whose BAL fluid contains high macrophage counts leaves little doubt as to the diagnosis of PLCH. Conversely, in patients with systemic symptoms and cavitated pulmonary nodules, as well as in the rare pure nodular forms, there is a long list of differential diagnoses, including mycobacterial infection, other infections, sarcoidosis, Wegener’s granulomatosis, cavitated pulmonary metastases, bronchiolar–alveolar carcinoma, septic emboli or cavitated P. Jiroveci pneumonia. In females, pure cystic PLCH may be difficult to differentiate from lymphangioleiomyomatosis (ultrasonography and computed tomography of the abdomen may show angiomyolipomas, thus supporting a diagnosis of lymphangioleiomyomatosis) 59. In practice, a presumptive diagnosis seems appropriate during the initial work-up of patients with typical manifestations and few or no symptoms, and the availability of HRCT has expanded the number of cases in which this is an option. Surgical lung biopsy can be performed during surgical pleurodesis in patients with recurrent or persistent pneumothorax. The present author’s group also perform lung biopsy in females with isolated diffuse pulmonary cystic lesions, symptomatic patients with predominant nodular lesions who are being considered for systemic corticosteroids and patients with atypical presentations. Conversely, in patients with extensive destructive lesions, lung biopsy may not be justified because of the excessive surgical risk entailed. Finally, biopsy of an extrathoracic lesion, for instance in a bone, may provide the diagnosis when the pulmonary manifestations are consistent with LCH. The natural history of the disease is widely variable, and unpredictable in the individual patient 7–9. Approximately 50% of patients experience a favourable outcome, either spontaneously or with glucocorticoid therapy. Partial or complete clearance of the radiological abnormalities occurs, and any symptoms resolve. However, lung function tests may show obstructive dysfunction. Approximately 10–20% of patients have early severe manifestations, consisting of recurrent pneumothorax or progressive respiratory failure with chronic cor pulmonale. Finally, 30–40% of patients show persistent symptoms of variable severity with conversion of radiological nodules into thick-walled and then thin-walled cysts that remain stable over time. Despite the apparent quiescence of the disease in these patients with persistent stable cysts, LC granulomas may be present in the pulmonary parenchyma 60. Thus, long-term follow-up is mandatory and may detect exacerbation of respiratory dysfunction after many years, or, rarely, a relapse with recurrent nodule formation 61, 62. Factors reported to predict adverse outcomes include onset of PLCH at an old age, prolonged constitutional symptoms, recurrent pneumothorax, extrathoracic lesions (except for bone involvement, which has no bearing on the prognosis), diffuse cysts on imaging studies and severe pulmonary function abnormalities on diagnosis (particularly abnormalities in the FEV1 and FEV1/VC, and, to a lesser extent, in RV/TLC) 17, 20, 21. None of these criteria is failure proof for predicting outcome in the individual patient. Severe pulmonary hypertension indicates a poor prognosis 47. Pregnancy does not seem to influence the course of PLCH in most patients. Exacerbation of LCH-related diabetes insipidus has been reported during pregnancy 63, 64. Thus, unless there is severe respiratory failure, LCH is not a contraindication to pregnancy. In addition to an association between LCH and lymphoma, a high rate of primary lung cancer has been reported in patients with PLCH, with continued smoking being a risk factor; various other malignancies have also been found to occur at increased rates 6, 21, 23, 24, 65–67. Since many patients with PLCH recover spontaneously or remain in a stable condition without treatment, the effectiveness of the various treatments used in this condition is difficult to assess. In addition, the low incidence of PLCH is a major obstacle to recruitment of a sufficient number of patients for controlled therapeutic trials. In practice, no effective treatments are available, and no randomised double-blind studies have been published. The mortality rate is difficult to evaluate because patients with minor symptoms are frequently lost to follow-up. Thus, mortality is probably overestimated in longitudinal studies of patients with PLCH 20, 21. The very tight association between PLCH and smoking suggests a causal role for cigarette smoke. Therefore, smoking cessation is mandatory. A smoking cessation programme may be needed, as these patients are often heavy smokers. Resolution of the disease after smoking cessation has been reported 68, 69. However, although likely, a beneficial effect on long-term outcomes has not yet been established, and a few cases of recurrence despite smoking cessation have been reported 62. Smoking cessation consistently reduces the risk of primary lung cancer, cardiovascular disease and progressive respiratory function impairment due to smoking-related chronic obstructive pulmonary disease, which are common events in patients with PLCH. Glucocorticoid therapy attenuates the constitutional symptoms and is advocated on empirical grounds in the treatment of recent-onset symptomatic nodular PLCH, for instance as prednisone or prednisolone at a starting dose of 0.5–1 mg·kg-1·day-1 tapered over 6–12 months 7, 8. It should be highlighted, however, that there are no evidence-based data for the use of this treatment in PLCH. Although glucocorticoid therapy may be associated with resolution of the symptoms and radiological abnormalities, it has not been proven to induce significant respiratory function improvement 18. Glucocorticoid therapy has been associated with worse outcomes in some studies, probably as a result of selection bias towards severe forms of the disease 20, 21. The present author’s group reserve glucocorticoid therapy for patients with symptomatic nodular disease, in the hope that this treatment may accelerate the resolution of inflammatory granulomatous lesions. Cytotoxic agents (vinblastine and, less often, methotrexate) are indicated in combination with glucocorticoid therapy in severe multisystemic LCH. There is no evidence that these agents are beneficial in adults with isolated PLCH. Although 2-chlorodeoxyadenosine has been shown to be useful in cases of refractory systemic LCH, an improvement in lung function in patients with PLCH has not been clearly demonstrated 70–72. Lower respiratory tract infection is a common cause of respiratory status deterioration in patients with PLCH and should lead to prompt and careful treatment. Pneumothorax requires drainage. Pleurodesis may also be needed 27. Pleurectomy is best avoided in those young patients who may one day be candidates for lung transplantation. A number of patients with very severe respiratory failure or major pulmonary hypertension have been treated with lung transplantation, with results similar to those found in patients with other patterns of diffuse infiltrating lung disease 73, 74. However, recurrence of the disease in the transplant within the first year has been reported, with possible risk factors being resumption of smoking and extrapulmonary involvement 73–77. Obstacles to defining the optimal follow-up strategy in patients with PLCH include the limited symptoms in some patients and, above all, the absence of effective treatments. A physical examination, chest radiography and lung function tests should be performed periodically, for instance at intervals of 3–6 months. Changes in the chest radiograph should lead to HRCT scanning. Although HRCT is useful for monitoring the natural history of PLCH, the optimal frequency and impact on management remain unclear. In particular, although the severity of pulmonary abnormalities on HRCT scans correlate with DL,CO 30, no studies comparing HRCT and lung function test results over time are available. Typically, obstructive ventilatory dysfunction is associated with worsening of the cystic lesions, which coalesce into bullous-like images in patients with advanced disease. However, since standard chest radiography is of low sensitivity for visualising pulmonary cysts, apparent radiographic stability of the lesions, or improvement due to substitution of cysts for nodules, is not infrequent in patients with gradually worsening obstructive dysfunction. Doppler echocardiography is useful for seeking pulmonary hypertension in patients with unexplained dyspnoea or suggestive radiographic changes. No reliable criteria are available for assessing the activity of PLCH. HRCT is not entirely reliable for identifying inactive disease because, even in patients with cysts as the only visible lesions, granulomas may persist in the pulmonary parenchyma 60. Recent preliminary results suggest that scintigraphy using indium-111 pentetreotide (a somatostatin analogue) may be useful in assessing lesion activity, although larger studies are needed to determine the role of this investigation in the management strategy 78–80. Since the aetiology of LCH is unknown, the pathogenesis of the disease remains poorly understood. In addition, no animal model is available for this disease, and, although the various clinical patterns of LCH share similar histopathological features, it is unclear whether similar mechanisms apply to all forms of LCH. The tremendous progress achieved recently in knowledge concerning the biology of dendritic cells (DCs), however, has given important input into the understanding of the mechanisms potentially involved in LCH 51, 52, 81, 82. In PLCH, pathogenic hypotheses must take into account at least three aspects: 1) the selective involvement of bronchioles by the LCH lesions and the initial accumulation of LCs at this site; 2) the ability of LC granulomas to destroy the bronchioles that they infiltrate; and 3) the very strong epidemiological link with smoking, as well as the low incidence of PCLH compared with the prevalence of smoking in the general population. It should be highlighted that a similar mechanism can be involved at these different steps, leading to, for example, both focal LC accumulation and the destructive effects of LCs on the bronchiole wall. LCs belong to the DC lineage, which forms a heterogeneous population of mobile cells produced in the bone marrow and whose main function is antigen presentation to T-cells 51, 52. Since the 1990s, studies in which various haematopoietic precursors were cultured in vitro with different combinations of growth factors and cytokines have identified various DC subsets 51, 52. Myeloid DCs (DC1) differentiate from CD34-positive myelomonocytic precursors in the presence of granulocyte-macrophage colony-stimulating factor (GM-CSF) and tumour necrosis factor (TNF)-α 83. DC1 can also be obtained from purified blood monocytes exposed to GM-CSF and interleukin (IL)-4 51. These precursors can also give rise to LCs, particularly in the presence of transforming growth factor (TGF)-β, which plays a crucial role in LC differentiation 84–86. More recently, another DC subset derived from lymphoid precursors (plasmacytoid DCs or DC2), whose survival is dependent not on GM-CSF but on IL-3, was identified in animals and humans 87. Under certain conditions, these cells can differentiate into LC-like cells 88, but the exact correspondence of these differentiation pathways with DC ontogeny in vivo is not completely established. In contrast to DCs that are present in most tissues (i.e. lymphoid organs, dermis, pulmonary parenchyma, etc. ), LCs are localised specifically in the epidermis and other mucosal epithelia, including the epithelium of the airways 51, 52, 89. These cells differ morphologically from other DCs by the presence in their cytoplasm of specific organelles, Birbeck granules, visible only by electron microscopy and involved in internalisation of exogenous substances. LCs can also be identified by the expression of the specific marker langerin (CD207), a type II mannose lectin that is constitutively associated with Birbeck granules 53. Beside the circulating precursors of LCs, it was recently shown that dermally resident CD14-positive cells can differentiate into LCs 90–92. The epithelial micro-environment is essential to LC recruitment and differentiation, in particular through local secretion of GM-CSF, TGF-β and the CC chemokine CCL20 (macrophage inflammatory protein (MIP)-3α) 51, 84, 85, 93–102. Other factors, such as the expression of E-cadherin by both epithelial cells and LCs, are important for the tissue homing of these cells 103–105. In the normal lung, LCs are virtually confined to the tracheobronchial epithelium, where they form a well-developed network 50, 106. Although LCs are extremely sparse in the normal alveolar epithelium, these cells are present in the alveoli of smokers and patients with pulmonary inflammation, in areas of alveolar epithelial hyperplasia 107, 108. In addition, abundant LC infiltrates may be found in lung cancer 108, 109. Interestingly, the presence of LCs in these different pathological situations was closely correlated with local GM-CSF production by hyperplastic alveolar cells, or bronchial tumour cells, strongly suggesting that GM-CSF plays a key role in controlling the recruitment and/or differentiation of LCs in the human lung 108. LCs, like other DCs found in peripheral tissues, are immature DCs and serve essentially as sentinels that take up antigens but do not induce an immune response in situ 51, 52, 89. In response to various stimuli (particularly pro-inflammatory signals such as lipopolysaccharide, TNF-α and IL-1β), these cells migrate via afferent lymph ducts to the regional lymphoid organs, where they stimulate the antigen-specific T-cells 110, 111. This migration towards secondary lymphoid organs is crucial to the induction of a specific immune response and is strongly influenced by the chemokine gradient between the afferent lymph ducts and the antigen introduction site 51, 52, 97, 98, 101, 112. During their migration, LCs lose their Birbeck granules, and switch their surface expression of the CC chemokine receptor CCR6 to CCR7, the ligand of CCL19 (MIP-3β), the chemokine produced in secondary lymphoid tissues. These cells lose their ability to capture antigens, and, in response to additional signals, particularly CD40–CD40 ligand (CD40L) interaction, become fully mature DCs that are able to secrete large amounts of IL-12 and efficiently activate T-lymphocytes 81, 113. Importantly, the micro-environment exerts a strong influence on DC function at all steps of the immune response and influences the elicitation of an efficient immune response or tolerance (fig. 5⇓). Thus, cytokines and membrane signals delivered to DCs influence the functional maturation of these cells, thereby directing the immune response to an effective T-helper cell (Th) type 1 response, or, conversely, to immune tolerance via activation of Th2 lymphocytes or regulatory T-lymphocytes 81, 82, 113. Thus, when pulmonary DCs from healthy animals are isolated and incubated in vitro with T-cells, they preferentially induce a Th2 response and immune tolerance 106, 114. Conversely, in the presence of inflammation-inducing signals, such as those emitted by microorganisms, cytokines such as GM-CSF or TNF-α, or membrane interactions (CD40–CD40L), these cells express costimulatory molecules and induce an effective Th1 cell-mediated immune response 106, 114, 115. Comparison of the surface phenotype and inhibitory/activating signal micro-environment of: a) immature, and b) mature dendritic cells (DCs). MHC II: class II major histocompatibility complex; LC: Langerhans’ cell; CCR: CC chemokine receptor; IL: interleukin; TGF: transforming growth factor; VEGF: vascular endothelial growth factor; LAMP: lysosome-associated membrane protein; TNF: tumour necrosis factor; CD40L: CD40 ligand. Consistent with their functional abilities, LCs, including LCs in normal lung, express a surface phenotype of immature DCs (table 1⇓). In particular, these cells show little or no expression of the costimulatory molecules CD40, CD80 (B7-1) and CD86 (B7-2) 50, 106, 114, 115. Interestingly, although LC counts are substantially increased at sites of alveolar epithelial hyperplasia and in some lung cancers, these cells remain negative for CD80, CD86 and CD40 115. In PLCH, numerous LCs accumulate in the bronchioles involved by the pathological process. The lesions are focal, involving some of the distal bronchioles but sparing others. This distribution suggests that changes in the bronchiolar epithelial micro-environment, presumably induced by cigarette smoking, are essential to bronchiolar LC accumulation. This bronchiolar infiltration by numerous LCs may be related to LC recruitment of LC precursors, local LC proliferation and/or decreased LC sensitivity to apoptosis-inducing mechanisms. As pointed out previously, bronchiolar epithelial cells can produce a number of mediators, most notably GM-CSF, known to regulate the proliferation and differentiation of haematopoietic LC precursors and to enhance their survival in vitro 108. In very early PLCH lesions, the epithelium of involved bronchioles produces larger amounts of GM-CSF than that of uninvolved bronchioles from the same patient 116. Interestingly, abundant GM-CSF production has also been found in skin LCH lesions, and the LCs in these lesions expressed the GM-CSF receptor 117. In addition, intradermal injection of GM-CSF into patients with leprosy is associated with accumulation of numerous LCs at the injection site, and skin from transgenic animals that overexpress the GM-CSF gene contains far more epidermal LCs than skin from control animals 95, 118, 119. Finally, GM-CSF transfection into the lung of mice promotes the differentiation and activation of a myeloid DC population, primarily by acting on macrophages during pulmonary immune responses 120. Taken together, these data strongly suggest a role for GM-CSF in the accumulation of LCs within LCH lesions, particularly in the lungs. Other mediators are produced by airway cells, however, and probably contribute to this process. For instance, hyperplasia of pulmonary neuroendocrine cells, producing peptides analogous to bombesin, has been reported in patients with PLCH, but the role of these cells in the pathogenesis of the disease remains unelucidated 121–123. Similarly, granulomatous lesions of PLCH produce large amounts of TGF-β, which is crucial to intra-epithelial LC differentiation 124. Finally, in two recent studies, CCL20 (MIP-3α) was shown to be produced within bone and skin LCH lesions 125, 126. Interestingly, the LCs of these granulomas expressed both CCR6, and, surprisingly, also CCR7 in one study 126. Similar studies have not been reported for PLCH. The rapid destruction of the bronchiolar epithelium by PLCH lesions indicates that nonepithelial factors must contribute to the maintenance of the LCs within the granuloma. LCs themselves produce many mediators, including GM-CSF, and may contribute to perpetuation of the lesions via an autocrine and/or paracrine mechanism 117, 122. In addition, immunohistochemical studies of pulmonary LC granulomas have identified several cytokines, of which some (including TNF-α and IL-4) influence LC growth, survival and differentiation in vitro, but their exact role in the pathogenesis of PLCH remains to be determined 121, 122. A dramatic improvement induced by anti-TNF-α therapy in a patient with severe systemic LCH has been reported 123. Other aspects of the selective intrabronchiolar accumulation of LCs in patients with PLCH remain to be investigated, including LC homing mechanisms and expression of addressins or specific adhesion molecules 127, 128. The ability of LCs to proliferate within LCH lesions is a matter of controversy. The division rate of LCs within PLCH granulomas is similar to that of normal bronchial epithelial cells and far lower than that of lung cancer cells, suggesting a limited role for cell division in LC accumulation within PLCH lesions 129. Conversely, at other sites, particularly in the skin and bone, LCs within LCH lesions express the proliferation marker Ki67, as well as other peptides involved in the cell cycle 130. The prolonged persistence of LCs within LCH granulomas seems to be ascribable to a decreased sensitivity to mechanisms inducing cell death by apoptosis 130–132. A central point concerning LCH is whether the disease results from a neoplastic process or is reactive to yet unidentified stimuli. Although LCs within lesions from patients with a variety of clinical presentations originate in clonal proliferation, supporting a neoplastic origin 133–135, another study suggests polyclonal expansion of LCs in the lungs of patients with PLCH 136. Thus, PLCH seems to be rather a reactive process in response to one or more unknown stimuli. In summary, a number of mechanisms contribute to the accumulation of LCs within PLCH lesions, although LC recruitment from precursors in the lungs and/or blood is probably preponderant. The increased number of CD34-positive precursors in peripheral blood from patients with PLCH further supports this hypothesis 137. In other situations characterised by LC accumulation within the lungs (e.g. alveolar epithelial hyperplasia and some lung cancers), the LCs do not induce tissue destruction and are not associated with large numbers of inflammatory cells, two important differences with PLCH 7. A possible explanation for the bronchiolar destruction seen in PLCH is that the LCs are in a special functional state that allows them to induce a local T-cell immune response with cytotoxic effects on the bronchiolar epithelial wall and adjacent lung tissue. Consistent with this hypothesis, apart from LCs, T-cells constitute the main cell population that is present in early PLCH lesions. This accumulation of T-cells occurs selectively within the specific lesions and T-cell counts are not increased in the unaffected parenchyma separating the granulomas 138. As with cell-mediated immune responses secondary to antigen stimulation, these T-cells are primarily CD4-positive and express αβ antigen receptors, as well as early activation markers 138. Using electron microscopic visualisation, the LCs in PLCH lesions contain many more Birbeck granules, cytoplasmic organelles that are involved in internalisation of exogenous substances, than normal LCs (fig. 3⇑) 138. LCs in this condition are seen to have close and differentiated membrane contacts with lymphocytes, similar to those seen in cutaneous hypersensitivity responses or when DCs are incubated with T-cells in vitro 138, 139. More recently, LCs in PLCH lesions were shown to express a unique surface phenotype, which strongly suggests that these are activated cells 115. Thus, LCs in PLCH lesions express CD80, CD86 and CD40, which are not found at the surface of LCs from normal lungs or other pulmonary lesions, such as alveolar epithelial hyperplasia or lung cancer 115. In addition, T-cells expressing CD40L are present in these lesions, supporting the existence of local interactions with LCs 115. These data, however, are not a definitive proof that these LCs are fully mature DCs and can induce T-cell proliferation. Indeed, local production of IL-12 by these cells has not been demonstrated, and the difficulty in isolating a sufficient number of LCs from PLCH lesions for in vitro studies has not permitted functional evaluation of these cells. Interestingly, however, the micro-environment surrounding LCs in PLCH lesions is conducive to local LC activation (table 1⇑). The cytokine profile (presence of GM-CSF, TNF-α and IL-1β but absence of IL-10) is similar to that which promotes DC maturation in vitro, whereas, in the other pathological situations in which LCs exhibit an immature phenotype, the opposite cytokine profile is found (presence of IL-10 and absence of IL-1β) 51, 82, 114, 115, 140. In summary, LCs in LCH lesions clearly exhibit an unusual surface phenotype, which suggests at least a partial maturation of these cells. Further studies are needed to precisely evaluate the functional abilities of these cells in PLCH granulomas, particularly the local activation of T-cells present in these lesions. Apart from a putative T-cell cytotoxicity directed against airway epithelial cells, mediators such as TGF-β and some types of metalloproteinase are produced locally and may be involved in the tissue remodelling, including cyst formation and fibrous reaction, seen as the lesions change over time 124, 141. The hypothesis that PLCH lesions result from an uncontrolled immune response implies that one or more antigens induces this response. To date, no candidate antigens have been identified. A viral cause was hypothesised initially when intramitochondrial inclusions were found in some granuloma LCs, and a role for the human herpesvirus 6 was suggested but not confirmed 135, 142–144. 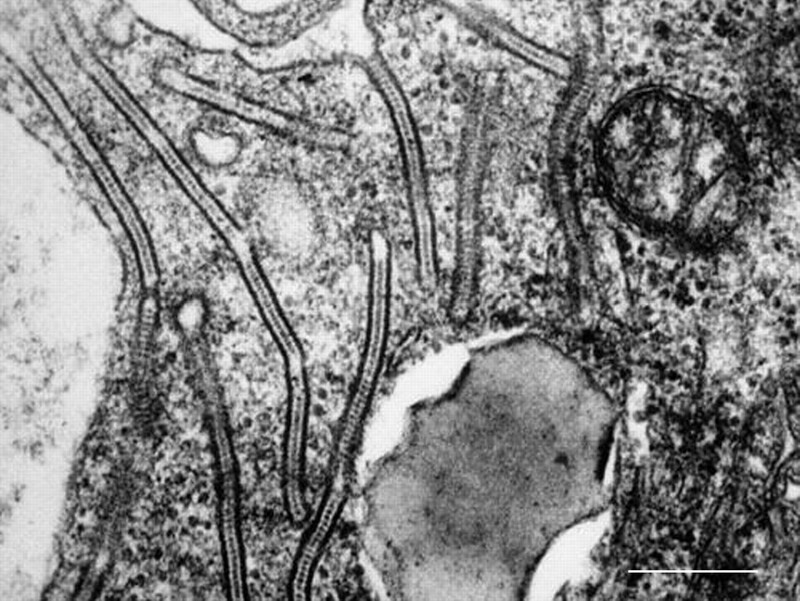 Testing for the genomes of a broad array of viruses within LCH lesions has yielded negative results 135, 144. The close association between smoking and PLCH strongly suggests a role for tobacco smoke in the pathogenesis of this disease. The role of smoking in triggering PLCH was highlighted recently by the finding that most children with systemic LCH who developed PLCH in adolescence or adulthood started to smoke before this event 145. In addition, in an animal model, one group reported accumulation of LC clusters in mouse lungs exposed to tobacco smoke, but this study has not been reproduced 146. The details regarding how tobacco smoke triggers the formation of PLCH lesions remain imprecise. An immune response to a component of tobacco smoke has been suggested, but, surprisingly, proliferation of blood lymphocytes from patients with PLCH in response to tobacco glycoprotein was found to be decreased compared with controls 147. More recently, the effects of nicotine on DC function were evaluated and both stimulatory and inhibitory effects were reported 148, 149. A direct effect of tobacco smoke, however, fails to explain the occurrence of PLCH in young children and, occasionally, in adult nonsmokers. Another possibility is that the bronchiolar epithelial cells are the target of the immune response in PLCH. Thus, the development of hyperplastic or dysplastic bronchiolar lesions may be involved in both the accumulation and activation of LCs in bronchioles, and, in addition, epithelial cells may express neoantigens, making them the target of an immune response. This hypothesis, which remains to be proved, would explain the bronchiole-centred distribution of the lesions, as well as the early destruction of the bronchiolar epithelium. Smoking, a common cause of bronchiolar epithelium alterations, may be a predisposing factor, but patients with bronchiolar abnormalities related to other factors (e.g. radiation therapy) may also be at risk of PLCH. However, the low incidence of PLCH compared with the high prevalence of smoking in the population at large strongly supports the existence of host-related factors that predispose to the development of this disease. Reports of recurrent disease in lungs transplanted into patients with PLCH are further evidence in favour of patient-related factors, the nature of which remain to be determined 73–77. Although some of the steps in the disease process that leads to pulmonary Langerhans’ cell histiocytosis are beginning to come to light, further work is needed to explain the different aspects of the Langerhans’ cell granuloma. A key goal is determination of the mechanisms involved according to the location and clinical expression of the disease. Improved understanding of the pathogenesis of Langerhans’ cell histiocytosis and, in particular, of the role of Langerhans’ cells should ultimately lead to the development of rational treatments for this orphan disease. Writing Group of the Histiocyte Society Histiocytosis syndromes in children. Lancet 1987;1:208–209. Favara BE, Feller AC, Pauli M, et al. Contemporary classification of histiocytic disorders. The WHO Committee on Histiocytic/Reticulum Cell Proliferations. Reclassification Working Group of the Histiocyte Society. Med Pediatr Oncol 1997;29:157–166. Lieberman PH, Jones CR, Steinman RM, et al. Langerhans cell (eosinophilic) granulomatosis. A clinicopathologic study encompassing 50 years. Am J Surg Pathol 1996;20:519–552. Malpas JS. Langerhans cell histiocytosis in adults. Hematol Oncol Clin North Am 1998;12:259–268. Arico M, Egeler RM. Clinical aspects of Langerhans cell histiocytosis. Hematol Oncol Clin North Am 1998;12:247–258. Howarth DM, Gilchrist GS, Mullan BP, et al. Langerhans cell histiocytosis: diagnosis, natural history, management, and outcome. Cancer 1999;85:2278–2290. Tazi A, Soler P, Hance AJ. Adult pulmonary Langerhans’ cell histiocytosis. Thorax 2000;55:405–416. Vassallo R, Ryu JH, Colby TV, Hartman T, Limper AH. Pulmonary Langerhans’-cell histiocytosis. N Engl J Med 2000;342:1969–1978. Sundar KM, Gosselin MV, Chung HL, Cahill BC. Pulmonary Langerhans cell histiocytosis: emerging concepts in pathobiology, radiology, and clinical evolution of disease. Chest 2003;123:1673–1683. Gaensler E, Carrington C. Open biopsy for chronic diffuse infiltrative lung disease: clinical, roentgenographic, and physiological correlations in 502 patients. Ann Thorac Surg 1980;30:411–426. Colby TV, Lombard C. Histiocytosis X in the lung. Hum Pathol 1983;14:847–856. Thomeer M, Demedts M, Vandeurzen K. Registration of interstitial lung diseases by 20 centres of respiratory medicine in Flanders. Acta Clin Belg 2001;56:163–172. Watanabe R, Tatsumi K, Hashimoto S, Tamakoshi A, Kuriyama T. Clinico-epidemiological features of pulmonary histiocytosis X. Intern Med 2001;40:998–1003. Arico M, Haupt R, Russotto VS, et al. Langerhans cell histiocytosis in two generations: a new family and review of the literature. Med Pediatr Oncol 2001;36:314–316. Friedman PJ, Liebow AA, Sokoloff J. Eosinophilic granuloma of lung. Clinical aspects of primary histiocytosis in the adult. Medicine (Baltimore) 1981;60:385–396. Crausman RS, Jennings CA, Tuder RM, et al. Pulmonary histiocytosis X: pulmonary function and exercise pathophysiology. Am J Respir Crit Care Med 1996;153:426–435. Basset F, Corrin B, Spencer H. Pulmonary histiocytosis X. Am Rev Respir Dis 1978;118:811–820. Schonfeld N, Frank W, Wenig S, et al. Clinical and radiologic features, lung function and therapeutic results in pulmonary histiocytosis X. Respiration 1993;60:38–44. Travis WD, Borok Z, Roum JH, et al. Pulmonary Langerhans cell granulomatosis (histiocytosis X). A clinicopathologic study of 48 cases. Am J Surg Pathol 1993;17:971–986. Delobbe A, Durieu J, Duhamel A, Wallaert B, the Groupe d’Etude en Pathologie Interstitielle de la Société de Pathologie Thoracique du Nord. Determinants of survival in pulmonary Langerhans’ cell granulomatosis (histiocytosis X). Eur Respir J 1996;9:2002–2006. Vassallo R, Ryu JH, Schroeder DR, Decker PA, Limper AH. Clinical outcomes of pulmonary Langerhans’-cell histiocytosis in adults. N Engl J Med 2002;346:484–490. Hance AJ, Basset F, Saumon G, et al. Smoking and interstitial lung disease. The effect of cigarette smoking on the incidence of pulmonary histiocytosis X and sarcoidosis. Ann N Y Acad Sci 1986;465:643–656. Neumann MP, Frizzera G. The coexistence of Langerhans’ cell granulomatosis and malignant lymphoma may take different forms: report of seven cases with a review of the literature. Hum Pathol 1986;17:1060–1065. Egeler RM, Neglia JP, Puccetti DM, Brennan CA, Nesbit ME. Association of Langerhans cell histiocytosis with malignant neoplasms. Cancer 1993;71:865–873. Unger J, England D, Collins J. Miliary nodules, Hodgkin’s disease, and eosinophilic granuloma. J Thorac Imaging 1994;9:71–73. Minghini A, Trogdon SD. Recurrent spontaneous pneumothorax in pulmonary histiocytosis X. Am Surg 1998;64:1040–1042. Mendez JL, Nadrous HF, Vassallo R, Decker PA, Ryu JH. Pneumothorax in pulmonary Langerhans cell histiocytosis. Chest 2004;125:1028–1032. Knight RK. Haemoptysis in eosinophilic granuloma. Br J Dis Chest 1979;73:181–186. Lacronique J, Roth C, Battesti JP, Basset F, Chretien J. Chest radiological features of pulmonary histiocytosis X: a report based on 50 adult cases. Thorax 1982;37:104–109. Moore AD, Godwin JD, Muller NL, et al. Pulmonary histiocytosis X: comparison of radiographic and CT findings. Radiology 1989;172:249–254. Epler G, McLoud T, Gaensler E. Normal chest roentgenograms in chronic diffuse infiltrative lung disease. N Engl J Med 1978;298:934–939. Brauner MW, Grenier P, Mouelhi MM, Mompoint D, Lenoir S. Pulmonary histiocytosis X: evaluation with high-resolution CT. Radiology 1989;172:255–258. Brauner MW, Grenier P, Tijani K, Battesti JP, Valeyre D. Pulmonary Langerhans cell histiocytosis: evolution of lesions on CT scans. Radiology 1997;204:497–502. Wall CP, Gaensler EA, Carrington CB, Hayes JA. Comparison of transbronchial and open biopsies in chronic infiltrative lung diseases. Am Rev Respir Dis 1981;123:280–285. Houssini I, Tomashefski J, Cohen A. Transbronchial biopsy in patients with pulmonary eosinophilic granuloma. Arch Pathol Lab Med 1994;118:523–530. Chollet S, Soler P, Dournovo P, et al. Diagnosis of pulmonary histiocytosis X by immunodetection of Langerhans cells in bronchoalveolar lavage fluid. Am J Pathol 1984;115:225–232. Xaubet A, Agusti C, Picado C, et al. Bronchoalveolar lavage analysis with anti-T6 monoclonal antibody in the evaluation of diffuse lung diseases. Respiration 1989;56:161–166. Auerswald U, Barth J, Magnussen H. Value of CD-1-positive cells in bronchoalveolar lavage fluid for the diagnosis of pulmonary histiocytosis X. Lung 1991;169:305–309. Casolaro MA, Bernaudin JF, Saltini C, Ferrans VJ, Crystal RG. Accumulation of Langerhans’ cells on the epithelial surface of the lower respiratory tract in normal subjects in association with cigarette smoking. Am Rev Respir Dis 1988;137:406–411. Feurestein IM, Archer A, Pluda JM, et al. Thin-walled cavities, cysts, and pneumothorax in Pneumocystis carinii pneumonia: further observations with histopathologic correlation. Radiology 1990;174:697–702. Pappas CA, Rheinlander HF, Stadecker MJ. Pleural effusion as a complication of solitary eosinophilic granuloma of the rib. Hum Pathol 1980;11:675–677. Pomeranz SJ, Proto AV. Histiocytosis X. Unusual-confusing features of eosinophilic granuloma. Chest 1986;89:88–92. Brambilla E, Fontaine E, Pison CM, et al. Pulmonary histiocytosis X with mediastinal lymph node involvement. Am Rev Respir Dis 1990;142:1216–1218. ten Velde GP, Thunnissen FB, van Engelshoven JM, Wouters EF. A solitary pulmonary nodule due to eosinophilic granuloma. Eur Respir J 1994;7:1539–1540. Khoor A, Myers JL, Tazelaar HD, Swensen SJ. Pulmonary Langerhans cell histiocytosis presenting as a solitary nodule. Mayo Clin Proc 2001;76:209–211. Vassallo R, Jensen EA, Colby TV, et al. The overlap between respiratory bronchiolitis and desquamative interstitial pneumonia in pulmonary Langerhans cell histiocytosis: high-resolution CT, histologic, and functional correlations. Chest 2003;124:1199–1205. Fartoukh M, Humbert M, Capron F, et al. Severe pulmonary hypertension in histiocytosis X. Am J Respir Crit Care Med 2000;161:216–223. Hamada K, Teramoto S, Narita N, et al. Pulmonary veno-occlusive disease in pulmonary Langerhans’ cell granulomatosis. Eur Respir J 2000;15:421–423. Nezelof C, Basset F, Rousseau MF. Histiocytosis X histogenetic arguments for a Langerhans cell origin. Biomedicine 1973;18:365–371. Hance AJ. Pulmonary immune cells in health and disease: dendritic cells and Langerhans’ cells. Eur Respir J 1993;6:1213–1220. Mellman I, Steinman RM. Dendritic cells: specialized and regulated antigen processing machines. Cell 2001;106:255–258. Valladeau J, Duvert-Frances V, Pin JJ, et al. The monoclonal antibody DCGM4 recognizes langerin, a protein specific of Langerhans cells, and is rapidly internalized from the cell surface. Eur J Immunol 1999;29:2695–2704. Geissmann F, Lepelletier Y, Fraitag S, et al. Differentiation of Langerhans cells in Langerhans cell histiocytosis. Blood 2001;97:1241–1248. Kambouchner M, Basset F, Marchal J, et al. Three-dimensional characterization of pathologic lesions in pulmonary langerhans cell histiocytosis. Am J Respir Crit Care Med 2002;166:1483–1490. Krenacs L, Tiszalvicz L, Krenacs T, Boumsell L. Immunohistochemical detection of CD1A antigen in formalin-fixed and paraffin-embedded tissue sections with monoclonal antibody 010. J Pathol 1993;171:99–104. Emile JF, Wechsler J, Brousse N, et al. Langerhans’ cell histiocytosis. Definitive diagnosis with the use of monoclonal antibody O10 on routinely paraffin-embedded samples. Am J Surg Pathol 1995;19:636–641. Ryu JH, Colby TV, Hartman TE, Vassallo R. Smoking-related interstitial lung diseases: a concise review. Eur Respir J 2001;17:122–132. Johnson S. Rare diseases. 1. Lymphangioleiomyomatosis: clinical features, management and basic mechanisms. Thorax 1999;54:254–264. Soler P, Bergeron A, Kambouchner M, et al. Is high-resolution computed tomography a reliable tool to predict the histopathological activity of pulmonary Langerhans cell histiocytosis?. Am J Respir Crit Care Med 2000;162:264–270. Powers MA, Askin FB, Cresson DH. Pulmonary eosinophilic granuloma. 25-year follow-up. Am Rev Respir Dis 1984;129:503–507. Tazi A, Montcelly L, Bergeron A, et al. Relapsing nodular lesions in the course of adult pulmonary Langerhans cell histiocytosis. Am J Respir Crit Care Med 1998;157:2007–2010. King TE Jr. Restrictive lung disease in pregnancy. Clin Chest Med 1992;13:607–622. DiMaggio LA, Lippes HA, Lee RV. Histiocytosis X and pregnancy. Obstet Gynecol 1995;85:806–809. Lombard CM, Medeiros LJ, Colby TV. Pulmonary histiocytosis X and carcinoma. Arch Pathol Lab Med 1987;111:339–341. Tomashefski JF, Khiyami A, Kleinerman J. Neoplasms associated with pulmonary eosinophilic granuloma. Arch Pathol Lab Med 1991;115:499–506. Sadoun D, Vaylet F, Valeyre D, et al. Bronchogenic carcinoma in patients with pulmonary histiocytosis X. Chest 1992;101:1610–1613. Von Essen S, West W, Sitorius M, Rennard SI. Complete resolution of roentgenographic changes in a patient with pulmonary histiocytosis X. Chest 1990;98:765–767. Mogulkoc N, Veral A, Bishop PW, et al. Pulmonary Langerhans’ cell histiocytosis: radiologic resolution following smoking cessation. Chest 1999;115:1452–1455. Saven A, Burian C. Cladribine activity in adult Langerhans-cell histiocytosis. Blood 1999;93:4125–4130. Pardanani A, Phyliky RL, Li CY, Tefferi A. 2-Chlorodeoxyadenosine therapy for disseminated Langerhans cell histiocytosis. Mayo Clin Proc 2003;78:301–306. Goh NS, McDonald CE, MacGregor DP, Pretto JJ, Brodie GN. Successful treatment of Langerhans cell histiocytosis with 2-chlorodeoxyadenosine. Respirology 2003;8:91–94. Boehler A. Lung transplantation for cystic lung diseases: lymphangioleiomyomatosis, histiocytosis x, and sarcoidosis. Semin Respir Crit Care Med 2001;22:509–515. Sulica R, Teirstein A, Padilla ML. Lung transplantation in interstitial lung disease. Curr Opin Pulm Med 2001;7:314–322. Etienne B, Bertocchi M, Gamondes JP, et al. Relapsing pulmonary Langerhans cell histiocytosis after lung transplantation. Am J Respir Crit Care Med 1998;157:288–291. Gabbay E, Dark JH, Ashcroft T, et al. Recurrence of Langerhans’ cell granulomatosis following lung transplantation. Thorax 1998;53:326–327. Habib SB, Congleton J, Carr D, et al. Recurrence of recipient Langerhans’ cell histiocytosis following bilateral lung transplantation. Thorax 1998;53:323–325. Calming U, Jacobsson H, Henter JI. Detection of Langerhans cell histiocytosis lesions with somatostatin analogue scintigraphy – a preliminary report. Med Pediatr Oncol 2000;35:462–467. Weinmann P, Crestani B, Tazi A, et al. 111In-pentetreotide scintigraphy in patients with Langerhans’ cell histiocytosis. J Nucl Med 2000;41:1808–1812. Lastoria S, Montella L, Catalano L, et al. Functional imaging of Langerhans cell histiocytosis by 111In-DTPA-d-Phe1-octreotide scintigraphy. Cancer 2002;94:633–640. Banchereau J, Paczesny S, Blanco P, et al. Dendritic cells: controllers of the immune system and a new promise for immunotherapy. Ann N Y Acad Sci 2003;987:180–187. Steinman RM, Hawiger D, Nussenzweig MC. Tolerogenic dendritic cells. Annu Rev Immunol 2003;21:685–711. Caux C, Dezutter-Dambuyant C, Schmitt D, Banchereau J. GM-CSF and TNF-α cooperate in the generation of dendritic Langerhans cells. Nature 1992;360:258–261. Geissmann F, Prost C, Monnet JP, et al. Transforming growth factor β1, in the presence of granulocyte/macrophage colony-stimulating factor and interleukin 4, induces differentiation of human peripheral blood monocytes into dendritic Langerhans cells. J Exp Med 1998;187:961–966. Caux C, Massacrier C, Dubois B, et al. Respective involvement of TGF-β and IL-4 in the development of Langerhans cells and non-Langerhans dendritic cells from CD34+ progenitors. J Leukoc Biol 1999;66:781–791. Zhang Y, Zhang YY, Ogata M, et al. Transforming growth factor-β1 polarizes murine hematopoietic progenitor cells to generate Langerhans cell-like dendritic cells through a monocyte/macrophage differentiation pathway. Blood 1999;93:1208–1220. Hochrein H, O’Keeffe M, Wagner H. Human and mouse plasmacytoid dendritic cells. Hum Immunol 2002;63:1103–1110. Mollah ZU, Aiba S, Nakagawa S, et al. Interleukin-3 in cooperation with transforming growth factor β induces granulocyte macrophage colony stimulating factor independent differentiation of human CD34+ hematopoietic progenitor cells into dendritic cells with features of Langerhans cells. J Invest Dermatol 2003;121:1397–1401. Knight SC, Burke F, Bedford PA. Dendritic cells, antigen distribution and the initiation of primary immune responses to self and non-self antigens. Semin Cancer Biol 2002;12:301–308. Ito T, Inaba M, Inaba K, et al. A CD1a+/CD11c+ subset of human blood dendritic cells is a direct precursor of Langerhans cells. J Immunol 1999;163:1409–1419. Larregina AT, Morelli AE, Spencer LA, et al. Dermal-resident CD14+ cells differentiate into Langerhans cells. Nat Immunol 2001;2:1151–1158. Arrighi JF, Soulas C, Hauser C, et al. TNF-α induces the generation of langerin/(CD207)+ immature Langerhans-type dendritic cells from both CD14-CD1a and CD14+CD1a- precursors derived from CD34+ cord blood cells. Eur J Immunol 2003;33:2053–2063. Borkowski TA, Letterio JJ, Farr AG, Udey MC. A role for endogenous transforming growth factor beta 1 in Langerhans cell biology: the skin of transforming growth factor beta 1 null mice is devoid of epidermal Langerhans cells. J Exp Med 1996;184:2417–2422. Charbonnier AS, Kohrgruber N, Kriehuber E, et al. Macrophage inflammatory protein 3α is involved in the constitutive trafficking of epidermal langerhans cells. J Exp Med 1999;190:1755–1768. Burnham K, Robb L, Scott CL, O’Keeffe M, Shortman K. Effect of granulocyte-macrophage colony-stimulating factor on the generation of epidermal Langerhans cells. J Interferon Cytokine Res 2000;20:1071–1076. Dieu-Nosjean MC, Massacrier C, Homey B, et al. Macrophage inflammatory protein 3α is expressed at inflamed epithelial surfaces and is the most potent chemokine known in attracting Langerhans cell precursors. J Exp Med 2000;192:705–718. Zlotnik A, Yoshie O. Chemokines: a new classification system and their role in immunity. Immunity 2000;12:121–127. Cook DN, Prosser DM, Forster R, et al. CCR6 mediates dendritic cell localization, lymphocyte homeostasis, and immune responses in mucosal tissue. Immunity 2000;12:495–503. Homey B, Dieu-Nosjean MC, Wiesenborn A, et al. Up-regulation of macrophage inflammatory protein-3 alpha/CCL20 and CC chemokine receptor 6 in psoriasis. J Immunol 2000;164:6621–6632. Godefroy S, Guironnet G, Jacquet C, Schmitt D, Staquet MJ. A combination of MIP-3α and TGF-β1 is required for the attraction of human Langerhans precursor cells through a dermal–epidermal barrier. Eur J Cell Biol 2001;80:335–340. Caux C, Vanbervliet B, Massacrier C, et al. Regulation of dendritic cell recruitment by chemokines. Transplantation 2002;73: Suppl. 1 S7–S11. Vanbervliet B, Homey B, Durand I, et al. Sequential involvement of CCR2 and CCR6 ligands for immature dendritic cell recruitment: possible role at inflamed epithelial surfaces. Eur J Immunol 2002;32:231–242. Tang A, Amagai M, Granger LG, Stanley JR, Udey MC. Adhesion of epidermal Langerhans cells to keratinocytes mediated by E-cadherin. Nature 1993;361:82–85. Udey MC. Cadherins and Langerhans cell immunobiology. Clin Exp Immunol 1997;107: Suppl. 1 6–8. Riedl E, Stockl J, Majdic O, et al. Ligation of E-cadherin on in vitro-generated immature Langerhans-type dendritic cells inhibits their maturation. Blood 2000;96:4276–4284. Holt PG. Antigen presentation in the lung. Am J Respir Crit Care Med 2000;162:S151–S156. Soler P, Moreau A, Basset F, Hance AJ. Cigarette smoking-induced changes in the number and differentiated state of pulmonary dendritic cells/Langerhans cells. Am Rev Respir Dis 1989;139:1112–1117. Tazi A, Bouchonnet F, Grandsaigne M, et al. Evidence that granulocyte macrophage-colony-stimulating factor regulates the distribution and differentiated state of dendritic cells/Langerhans cells in human lung and lung cancers. J Clin Invest 1993;91:566–576. Colasante A, Poletti V, Rosini S, Ferracini R, Musiani P. Langerhans cells in Langerhans cell histiocytosis and peripheral adenocarcinomas of the lung. Am Rev Respir Dis 1993;148:752–759. Geissmann F, Dieu-Nosjean MC, Dezutter C, et al. Accumulation of immature Langerhans cells in human lymph nodes draining chronically inflamed skin. J Exp Med 2002;196:417–430. Stoitzner P, Holzmann S, McLellan AD, et al. Visualization and characterization of migratory Langerhans cells in murine skin and lymph nodes by antibodies against langerin/CD207. J Invest Dermatol 2003;120:266–274. Sallusto F, Lanzavecchia A. Understanding dendritic cell and T-lymphocyte traffic through the analysis of chemokine receptor expression. Immunol Rev 2000;177:134–140. Trinchieri G. Interleukin-12 and the regulation of innate resistance and adaptive immunity. Nat Rev Immunol 2003;3:133–146. Stumbles PA, Upham JW, Holt PG. Airway dendritic cells: co-ordinators of immunological homeostasis and immunity in the respiratory tract. APMIS 2003;111:741–755. Tazi A, Moreau J, Bergeron A, et al. Evidence that Langerhans cells in adult pulmonary Langerhans cell histiocytosis are mature dendritic cells: importance of the cytokine microenvironment. J Immunol 1999;163:3511–3515. Tazi A, Bonay M, Bergeron A, et al. Role of granulocyte-macrophage colony stimulating factor (GM-CSF) in the pathogenesis of adult pulmonary histiocytosis X. Thorax 1996;51:611–614. Emile JF, Fraitag S, Andry P, et al. Expression of GM-CSF receptor by Langerhans’ cell histiocytosis cells. Virchows Arch 1995;427:125–129. Kaplan G, Walsh G, Guido LS, et al. Novel responses of human skin to intradermal recombinant granulocyte/macrophage-colony-stimulating factor: Langerhans cell recruitment, keratinocyte growth, and enhanced wound healing. J Exp Med 1992;175:1717–1728. Xing Z, Gauldie J, Tremblay GM, Hewlett BR, Addison C. Intradermal transgenic expression of granulocyte-macrophage colony-stimulating factor induces neutrophilia, epidermal hyperplasia, Langerhans’ cell/macrophage accumulation, and dermal fibrosis. Lab Invest 1997;77:615–622. Wang J, Snider DP, Hewlett BR, et al. Transgenic expression of granulocyte-macrophage colony-stimulating factor induces the differentiation and activation of a novel dendritic cell population in the lung. Blood 2000;95:2337–2345. de Graaf JH, Tamminga RY, Dam-Meiring A, Kamps WA, Timens W. The presence of cytokines in Langerhans’ cell histiocytosis. J Pathol 1996;180:400–406. Egeler RM, Favara BE, van Meurs M, Laman JD, Claassen E. Differential in situ cytokine profiles of Langerhans-like cells and T cells in Langerhans cell histiocytosis: abundant expression of cytokines relevant to disease and treatment. Blood 1999;94:4195–4201. Henter JI, Karlen J, Calming U, et al. Successful treatment of Langerhans’-cell histiocytosis with etanercept. N Engl J Med 2001;345:1577–1578. Asakura S, Colby TV, Limper AH. Tissue localization of transforming growth factor-β1 in pulmonary eosinophilic granuloma. Am J Respir Crit Care Med 1996;154:1525–1530. Annels NE, Da Costa CE, Prins FA, et al. Aberrant chemokine receptor expression and chemokine production by Langerhans cells underlies the pathogenesis of Langerhans cell histiocytosis. J Exp Med 2003;197:1385–1390. Fleming MD, Pinkus JL, Alexander SW, et al. Coincident expression of the chemokine receptors CCR6 and CCR7 by pathologic Langerhans cells in Langerhans cell histiocytosis. Blood 2003;101:2473–2475. de Graaf JH, Tamminga RY, Kamps WA, Timens W. Expression of cellular adhesion molecules in Langerhans cell histiocytosis and normal Langerhans cells. Am J Pathol 1995;147:1161–1171. Riedl E, Stockl J, Majdic O, et al. Functional involvement of E-cadherin in TGF-β1-induced cell cluster formation of in vitro developing human Langerhans-type dendritic cells. J Immunol 2000;165:1381–1386. Brabencova E, Tazi A, Lorenzato M, et al. Langerhans cells in Langerhans cell granulomatosis are not actively proliferating cells. Am J Pathol 1998;152:1143–1149. Schouten B, Egeler RM, Leenen PJ, et al. Expression of cell cycle-related gene products in Langerhans cell histiocytosis. J Pediatr Hematol Oncol 2002;24:727–732. Savell VH Jr, Sherman T, Scheuermann RH, Siddiqui AM, Margraf LR. Bcl-2 expression in Langerhans’ cell histiocytosis. Pediatr Dev Pathol 1998;1:210–215. Marchal J, Kambouchner M, Tazi A, Valeyre D, Soler P. Expression of apoptosis-regulatory proteins in lesions of pulmonary Langerhans cell histiocytosis. Histopathology 2004;45:20–28. Willman CL, Busque L, Griffith BB, et al. Langerhans’-cell histiocytosis (histiocytosis X) – a clonal proliferative disease. N Engl J Med 1994;331:154–160. Yu RC, Chu C, Buluwela L, Chu AC. Clonal proliferation of Langerhans cells in Langerhans cell histiocytosis. Lancet 1994;343:767–768. Willman CL, McClain KL. An update on clonality, cytokines, and viral etiology in Langerhans cell histiocytosis. Hematol Oncol Clin North Am 1998;12:407–416. Yousem SA, Colby TV, Chen YY, Chen WG, Weiss LM. Pulmonary Langerhans’ cell histiocytosis: molecular analysis of clonality. Am J Surg Pathol 2001;25:630–636. Misery L, Rougier N, Crestani B, et al. Presence of circulating abnormal CD34+ progenitors in adult Langerhans cell histiocytosis. Clin Exp Immunol 1999;117:177–182. Tazi A, Bonay M, Grandsaigne M, et al. Surface phenotype of Langerhans cells and lymphocytes in granulomatous lesions from patients with pulmonary histiocytosis X. Am Rev Respir Dis 1993;147:1531–1536. Enk AH, Katz SI. Contact sensitivity as a model for T-cell activation in skin. J Invest Dermatol 1995;105: Suppl. 1 80S–83S. Akbari O, DeKruyff RH, Umetsu DT. Pulmonary dendritic cells producing IL-10 mediate tolerance induced by respiratory exposure to antigen. Nat Immunol 2001;2:725–731. Hayashi T, Rush WL, Travis WD, et al. Immunohistochemical study of matrix metalloproteinases and their tissue inhibitors in pulmonary Langerhans’ cell granulomatosis. Arch Pathol Lab Med 1997;121:930–937. Leahy MA, Krejci SM, Friednash M, et al. Human herpesvirus 6 is present in lesions of Langerhans cell histiocytosis. J Invest Dermatol 1993;101:642–645. Glotzbecker MP, Carpentieri DF, Dormans JP. Langerhans cell histiocytosis: a primary viral infection of bone? Human herpes virus 6 latent protein detected in lymphocytes from tissue of children. J Pediatr Orthop 2004;24:123–129. Slacmeulder M, Geissmann F, Lepelletier Y, et al. No association between Langerhans cell histiocytosis and human herpes virus 8. Med Pediatr Oncol 2002;39:187–189. Bernstrand C, Cederlund K, Sandstedt B, et al. Pulmonary abnormalities at long-term follow-up of patients with Langerhans cell histiocytosis. Med Pediatr Oncol 2001;36:459–468. Zeid NA, Muller HK. Tobacco smoke induced lung granulomas and tumours: association with pulmonary Langerhans cells. Pathology 1995;27:247–254. Youkeles LH, Grizzanti JN, Liao Z, Chang CJ, Rosenstreich DL. Decreased tobacco-glycoprotein-induced lymphocyte proliferation in vitro in pulmonary eosinophilic granuloma. Am J Respir Crit Care Med 1995;151:145–150. Nouri-Shirazi M, Guinet E. Evidence for the immunosuppressive role of nicotine on human dendritic cell functions. Immunology 2003;109:365–373. Aicher A, Heeschen C, Mohaupt M, et al. Nicotine strongly activates dendritic cell-mediated adaptive immunity: potential role for progression of atherosclerotic lesions. Circulation 2003;107:604–611.